It’s bad enough getting these timeout message from the SAIX news server, but now it’s happening with Blogspot blogs as well. The server at http://www.blogger.com is taking too long to respond. Is anyone else getting these messages, or do we just have a slow connection? I have three general blogs on three different blogging platforms, and occasionally I compare them to see which is most popular. 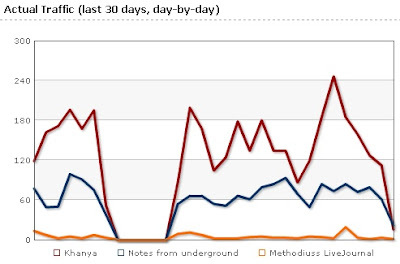 The blogs are Notes from Underground on Blogger (this one), Khanya on WordPress, and my LiveJournal. The graph from Amatomu below shows that the oldest, the LiveJournal one, has the fewest readers, while the newest one, the WordPress one, seems to have the most readers. Is this because readers prefer WordPress to blogger? But knowing which one readers prefer also affects the way I write. I now tend to be more careful about what I wrote on the Khanya blog, knowing that more people will probably read it. Notes from underground tends to get used for quick ‘n dirty posts, and the LiveJournal even more so, or even just for pointers to posts on one of the others, if I think some of my LiveJournal friends might be interested, and I hope that some of them may comment. Have fascist Israeli Zionists hacked Blogger? The reason I checked was because a friend suggested to me that I might be under attack for voicing concern for the Palestinians. He was right. He too had apparently been targeted earlier and kicked off WordPress for violating policies. He had supported the Palestinians’ human rights (without being anti-Semitic). The political Zionists conflate their views with Jewishness, leaving anything that disagrees with their position outside Jewishness, which is a position designed by Machiavellians (liars) to appeal to the weak-minded. It’s akin to many in the U.S. who claim that to be anti-war is anti-American. Well, whether they like it or not, I’m a seven-generation-plus American (signifies with the American Indians) and I’m also anti-War! The comment was sent to me after I said I could not read my Blogger blogs, or anyone else’s. In the absence of any response from Google, it seems to have some merit. Blogger problems persist, even though I have tried it with two different browsers and three different computers, I still get a “403 forbidden” message when I try to read any of my Blogger blogs of Blogspot. I get the same message when I try to read any other blogs on Blogspot too. I have already moved my family history blog to http://hayesgreene.wordpress.com/, and will move this one too if the problem persists. In the mean time, I’m still blogging at Khanya blog. End of the road for Blogger? For more than a year now I’ve had a blog on Blogger and one on WordPress, and have posted about equally on both. I found it hard to decide which platform I preferred, but this just about clinches it. It seems that I can post, but the moment I try to read my posts, I get that message. If that’s lasts any longer, you certainly won’t be seeing me much longer on Blogger. And obviously, if I can’t read my blog, I can’t read or respond to comments, so if you would like to comment on this, please do so on my WordPress blog. Today this blog reappeared on the Amatomu radar for the first time in more than a month — it was ranked 200, and my other blog, Khanya was ranked 150 — nice round figures, so I thought it worth remarking on them. For more than a month now this blog has been ranked somewhere in the 230-240 range, so why did it suddenly shoot up to 200, and reappear in the top 30 in the News and Politics section? Not because there were any more readers, apparently. The number of readers has remained fairly constant for the last few days. So it must be because there was a drop in the number of readers of the other blogs on Amatomu, no doubt caused by the long weekend, and blog readers going away to where there are more interesting things to do than read blogs. So where have all the blog readers gone? I somehow can’t imagine that most of them have gone to Moria, even though a very large number of South Africans do go there on the Western Easter weekend — the top bloggers on Amatomu somehow don’t seem to be the type. No doubt from today until the end of the week we will be able to read on their blogs what they have done, and this blog can sink back into obscurity again. The other question raised by this is why the number of readers of this blog, even though it did not rise, apparently did not drop off as much as some other blogs. And perhaps that is answered by the Amatomu stats as well. Nobody seems to have read much that I have posted in the last week, and there haven’t been many comments on recent posts. The most popular post, by far, remains one I wrote several months ago, commenting on a list of books to read before you die. It’s still top with 232 reads over the last 30 days. The second one, Easter – Christian or pagan , which was posted even longer ago, has shot up, with 111 reads. Perhaps that explains why there hasn’t been such a drop off. The other thing that needs some explanation is why my Khanya blog, which I started a year ago, is more popular than this one — it is ranked 150 on Amatomu, whereas this one is at 200. The only reason I can think of is that WordPress blogs are more popular than Blogger blogs. I started the Khanya blog on WordPress at a time when many of the blogs I read were switching from Blogger to WordPress, because of the “new and improved” Blogger, in which many of the features no longer worked, and there seemed to be a mass migration to WordPress as dissatisfaction with the reduced functionality of Blogger increased. But that doesn’t explain why readers seem to prefer WordPress blogs to Blogger ones, and the Amatomu statistics don’t give much of a clue about that. They reveal the phenomenon, but they don’t explain it. Father David MacGregor has linked together a number of reports in his Contact Online blog about the Archbishop of Canterbury’s views on introducing Sharia law into Britain, which has set a herd of cats among the pigeons. Post truncated … read the rest here. This post was actually posted at 6:00 pm, and should have appeared above the post above this, instead of below it. But Blogger has a bug that only allows it to post in the mornibng, and an ything posted after noon is moved 12 hours back. Maybe they will fix this bug next year, or the year after, but until they do, read the rest of this post here.